SF Said is an award-winning author. He was born in Lebanon in 1967, but has lived in London since he was 2 years old. He wrote his first novel, Varjak Paw (2003), while working as a speechwriter for the Crown Prince of Jordan, and then as an arts journalist and film programmer. 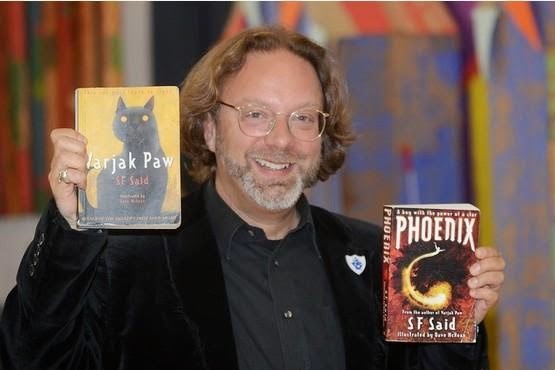 Varjak Paw won the Nestlé Smarties Book Prize for Children's Literature, as well as regional book of the year awards in Gateshead, Stockton and West Sussex. It has since been adapted as a stage play and an opera, and a film version is in development. It has been translated into 12 languages, and worldwide sales are now over half a million. The sequel, The Outlaw Varjak Paw (2005), won the BBC's Blue Peter Book Of The Year, was nominated for the Carnegie Medal, and won the Leicester Teenage Book Of The Year. Varjak Paw is currently featured on the CLPE's recommended reading list for primary schools, and both books are being taught in classrooms around the UK. SF's third novel, Phoenix (2013), is an epic space adventure for readers of 9 and up. It was chosen as an IBBY Honour List Book for the UK; shortlisted for the Guardian Children's Fiction Award; nominated for both the CILIP Carnegie Medal and the Kate Greenaway Medal; and won both the Warwickshire Secondary Schools Book Of The Year Award and the Haringey Children's Book Award. Like the Varjak Paw books, it is illustrated by Dave McKean, and published by David Fickling Books. Hi Frances, thank you so much for your lovely comment! And you're most welcome - I always recommend that schools get in touch with a local bookseller for events, and try to put them in touch with one if they don't already have links. It just makes sense in every way! In fact, I would always urge my readers to buy books from bookshops. I love bookshops; I love their physical space and browsability, and of course the expertise of booksellers. Those are things that you can't get on the internet, and I think we would really miss them if bookshops were no longer able to function as businesses... That's why I personally make a big effort to buy my books from shops that I love and want to support! 1. Who was your biggest inspiration as a writer? 2.Which book did you enjoy writing the most and who was your favourite character? 3. Where did you get the name Varjak from? 5. Are you planning on writing any more books in the future? Hello SF Said, you probably might remember me, you came to visit my school, New North Academy. Anyways, my class and me would really appreciate if you came to watch us perform Varjak Paw, with your permission of course. I love reading your books because they are interesting and fun. P.S. The date is Tuesday 23rd June 2014. Hello Leah, and thank you for your kind messages! I'm really looking forward to watching your performance of Varjak Paw – it's exciting for a writer to see a stage version of one of their books. Please say hello to everyone at New North Academy for me, and see you soon! 1. I was very inspired by all the books I loved myself. It's hard to pick out one, but Watership Down by Richard Adams was definitely a big inspiration for me. If you want to know more about this amazing book, I wrote a blog about it here! 3. It was the name of my own cat! 4. Watership Down (see question 1) was a big one. I did also love The Cat In Hat, by Dr Seuss. Thanks again for your message, and happy reading! Dear SF Said, I am writing to you to tell you how much I loved reading Varjak Paw and The Outlaw Varjak Paw. They are my favourite books I have ever read in my life. My mummy has ordered your new book Phoenix for me, I am very much looking forward to reading it. However, what I would love to know is,will you be writing more Varjak Paw books. I have really enjoyed them. Thank you so much for your amazing message! It means a lot to a writer to hear a wonderful thing like that. To answer your question, I will be writing one more book about Varjak Paw, one day. I wrote a bit about this question in this blog post. In the meantime, I hope you will enjoy Phoenix too – please let me know what you think when you've had a chance to read it! Thank you very much for your kind message! It was a real pleasure to visit Bancroft's. I'll hopefully be doing a few public appearances this year, and will post details about them here or on twitter (@whatSFSaid). When will your new book tyger come out, because phoenix is one of my favourite books ever. Thank you so much for that fantastic comment! I really appreciate it, and I'm really glad Phoenix is one of your favourite books! I have to be honest – I have no idea when Tyger will come out. I'm about 2 years into writing it at the moment. Phoenix took 7 years in the end, so it might be a while yet! I hope it won't be as long as that, but I want my books to be as good as they can possibly be, and that always takes a long time and a lot of hard work. So please be patient; Tyger will come out one day, and I think it might be even better than Phoenix when it does! Thank you so much for your lovely comment, it means a lot to me! I'm really glad to hear you're enjoying literacy with Varjak Paw. Keep the Way alive! Thank you so much for your comment! It was a pleasure to visit Vinehall and to meet everyone there. And it's great to hear that you've enjoyed my books. The Way is the whole way of living that Jalal teaches Varjak. This includes the Seven Skills, but also everything that he learns in The Outlaw Varjak Paw, and perhaps a bit more in the third book, when I write it! Phoenix has many sources of inspiration. One of them is the stars themselves, and the science of the universe, which I find totally fascinating. I wrote a little bit about this here. Another inspiration is ancient mythology, which I also love. I wrote a little bit about this here. In Phoenix, I wanted to try and bring science and mythology together, somehow. I hope you liked it! Thank you, that's very kind! I'm 2 1/2 years into writing Tyger at the moment; I don't know when it will be finished, but I hope not as long as the 7 years it took me to write Phoenix! My name is Nell. My classmates and I would like to ask you a question. Who inspired you to become a writer? We really liked your Varjak Paw books when we read them in class because they were adventurous and sometimes spooky. We hope you continue to write more Varjak Paw books. Hi! Im name is Rachel and I just adore your books! I can't wait for the 3rd Varjak Paw! When do you think that it will be published? Thank so much for your fantastic comment! I'm really glad that you and your classmates enjoyed the Varjak Paw books. I am planning to write a third one, one day; I wrote a bit about my idea for it here. In the meantime, I hope you'll enjoy my new book Phoenix too – it might sound quite different on the surface, but I think it has a lot in common with Varjak Paw. To answer your question, I was inspired to become a writer by all the books and authors that I loved myself. They meant so much to me that I wanted to write books of my own one day. I wrote a little bit about one of my biggest inspirations here. Thank you so much for that lovely comment, it really means a lot! I don't know when the third Varjak Paw book will be published, as I haven't written it yet. I think it's a book that I need to be older to write. I wrote a bit about the reasons for this here. It will happen one day, though, so please do keep the Way alive! Hi Daisy, thank you very much for your kind comment! I will write a third book about Varjak Paw one day - I wrote a bit about my idea for it here. In the meantime, I hope you'll try my new book Phoenix. It's not about Varjak, but I think if you enjoyed his adventures, you will enjoy it too! Thank you very much for your message, and your kind words! The best advice I can give anyone who is writing a story is this: write the story that you most want to read yourself. Tell yourself the story, and make it as good as you would want the story to be, as a reader. I've done a few writing tips on my blog – have a look, I hope you'll find them helpful! Hi there, I'm Megan and I just want to tell you how amazing I think Phoenix is. Last Friday you visited my school, Whitworth High, and I'm glad I got to meet you. Between us, me and my friend Lexi (you might remember us ;P) got all three books and I decided I wanted to read Phoenix first. And I couldn't stop. I'm one of those people who enjoys reading everything, but Phoenix is by far one of the best books I've read and I can't wait to read Varjak paw. Oh, one other thing. Have you ever heard of a website called Wattpad? It's really good for both people who want to read and people who want to write. You publish your books online and anyone can read them, but you also get comments about your books, how you could improve and what people do and don't enjoy. I've been on Wattpad for nearly 3 years now and I love it. I recommend checking it out. But I'm not forcing you. If you like keeping drafts more personal, I don't mind. I just thought I'd share it with you. Hi Megan, and thank you so much for your fantastic comment! It really means a lot to hear things like that about my books. Phoenix took me seven years to write, but all the hard work feels worthwhile when I hear something like that from a reader like you! I have heard of Wattpad, and I think it's a great thing. It's not something that would work for me personally, but it sounds like you're finding it helpful, and I'm all in favour of anything that helps people write the stories they want to write! I hope you enjoy Varjak Paw too. And please give my best to Lexi and everyone at Whitworth – it was a real pleasure visiting your school and meeting you all! Thank you so much for your awesome comment! I really enjoyed visiting your school and meeting everyone. I hope you enjoy Phoenix – please let me know what you think when you've had a chance to read it! I just wanted to say that your books hold a very special place in my heart. I read them when I was younger (I'm 16 now) and they sparked a seemingly lifelong interest in literature for me - I'm now starting on my own writing journey! There must have been one year where I read nothing but Varjak Paw over and over again, and it was either in my bookbag or on my bedside. I can still remember how I pictured Varjak and his surroundings in my mind's eye, even so vividly to this day. To me, it was so much more than a story about a cat that did martial arts, and still is. So, thank you for inspiring me, and I'm sure many more kids just like me! Hello Eleanor! And thank you so much for that amazing message. You have no idea how much it means to me to hear things like that from readers. The idea that my books might become part of people's lives is just incredible, and makes all the hard work of writing them worthwhile. Have you had a chance to read my new book Phoenix yet? And what are you writing yourself at the moment? It's no problem at all! And I've just ordered Phoenix, which sounds absolutely brilliant. I'm about halfway through my first proper book, a detective story set in London. I won't go into details as that would take a while, but basically a circle of the most powerful people in the country start getting killed off by a man that should be dead, and still appears to be. It turns out that there's something more off about the victims than would have seemed at first. It's called The Dead Men's League. It's pretty silly, I know, and I'm still only on the first draft, but everyone has to start somewhere, eh? I usually only write poems or short stories for a few competitions, but I decided to just jump into the deep end and go for it. Keep the Way alive, and thank you for replying to my comment so quickly! I think that sounds like a great idea for a book! On a first draft, I would keep writing every day until you reach the end, and don't worry about what anyone else might think. Just keep going, that's the main thing! I've done a few writing tips here on the site - I hope some of them might be useful. Wow, thanks! I'll keep soldiering on, and I'll check out the writing tips now. Looking forward to Phoenix arriving! Thanks again, I hope you have a great weekend! Best of luck with the writing! I hope the tips are helpful - start at the bottom of that page, with the first one, and work your way back up. Hello SF - What made you write about cats? Hello Jacob, Isaac and Sam! Thank you for your question. I was inspired to write about cats by watching my own cat's adventures as he went out into the world for the first time. I wrote a little bit about that in this blog. I hope you're enjoying reading Varjak Paw! My name is Ashwin, and I hear that you'll be coming to WCM soon! Me and my classmates can't wait. We recently read Varjak Paw and Phoenix and think they were great books. Personally you've inspired me to try to write books! Thank you so much for your great comment! I'm really looking forward to visiting your school; it's brilliant to hear that you and your classmates enjoyed my books! Good luck with your own writing - my number one piece of advice is to write the stories that you most want to read yourself. Thank you so much, Travis - not long to go now! I loved it when you came and my literacy teacher said you read my 5 min draft and you said it was anazing! I was so happy and grateful!!! My fave book is PHEONIX!!! It was awesome and I loved it! Thank you for coming to our school. Now I want to become a half time authour!!! You're welcome, Travis! It was great to meet you, and I loved hearing the story you wrote. I think it would be amazing if you wrote a sequel to Phoenix - I'd love to read it one day! You came to our school today and this is probably from everyone from Y4 to our class. I really enjoyed it and your writing tips helped improve my story writing. Would love if I could email my draft when complete to you. Thank you so much for your fantastic comments - I'm so glad you enjoyed the visit today, and that Phoenix is your favourite book - that really means a lot! I loved hearing your story, and I think you should definitely write more stories! Thank you so much - I'm really glad you found the writing workshop helpful! Your teacher said he'd send me over some of your stories, so if you pass it on to him, he'll pass it on to me. Good luck with your writing - here's a link to a blog I made with some writing tips that you might find useful! Thank you so much for writing this, Travis, and for posting it here! It's amazing for me to see someone taking the characters and the universe I created, and making their own story from it. I hope you keep writing, and keep working on your stories. Work on them as hard as you can, for as long as you can, to make them the very best they can be! Always keep pushing - keep trying to improve them and finding ways to make them better. I think you've got some great teachers in your school who can help you become even better at writing. And I've done a series of writing tips on this blog – I hope some of them will be useful. I am writing from a Hallfield Primary School in London. We are beginning to read your super story Varjak Paw! So far we are just studying the first few chapters, which are really exciting us! Would you mind answering a few questions for us? - How did your Lebanese background influence your story? - Why did you decide on Varjak to be your main character? - How important is setting in the plot? Top of the morning to you at said my name is Ellis from whaplode primary school me my class mates and our teacher Mrs adie love your book well be hoping for the Phoenix soon your Epic!!!! Thank you for your kind words about Varjak Paw - I'm glad you're enjoying the story! - I'm not Lebanese; I was only born in Lebanon. But I do have Mesopotamian ancestors, and that definitely influenced my story! - I based Varjak on my own cat, who was also called Varjak Paw. I wrote a little about him in this blog post. - I think setting is very important, but character is even more important. Thank you so much, Ellis - that's very kind! I hope you enjoy Phoenix - please let me know what you think when you've had a chance to read it! Your book called Pheonix really hit me and deep inside it was the best and the most considerate piece of story and this inspires me to write my self and I wish you the best luck on your next book. Thank you so much! I like that part of the book too - Bixa's needles are among my favourite things in the whole of Phoenix! Thank you so much for your wonderful comment - that really means a lot to me. Good luck with your own writing - and if you want to know more about my next book, here's a link to a blog I wrote about it. My name is Alex and I'm a big fan of Varjak Paw. My daddy told me that he told you that I'd written a story and you'd like to see it. Varjak dreamt he was in Mesopotamia with Jalal. Jalal said “You have done it Varjak you’re our hero now”. That night Varjak, Holly, Razor, Cludge, Tam, the two Scratch Sisters and Old Buckley were sleeping perfectly happily until a claw ripped out and hurt Holly badly. The cat’s eye had been cut off in a fight. Her name was Sor and she was looking for her beloved Sally Bones, but secretly Varjak had killed Sally Bones. “My name is Sor and I am looking for Sally Bones”, she said. Holly gasped, so did everyone else. Sor said, “You killed my Sally Bones! “That’s it, I will get my revenge on you, you hear me?” and she walked into the dark alleys. “What was that all about?” asked Razor. As they entered the Free Cats’ territory Miss Moggs crying her eyes out. She said, “Sor has kidnapped all the Free Cats! I could not bear to come. Meanwhile Sally Bones looked down from the secret alleys. “My mother is looking for me,” she said. “Hello Sally Bones I am your mother and we could team up and kill Varjak Paw and his friends!” Sor said, but slowly a big hand snatched up Sor and Sally Bones. They never saw Sally Bones nor her mother again. it's alex again , I really like the drawings of the book and the cats. My favourite character is Cludge. Thank you so much for posting your story here! I think it's brilliant. I particularly like the way you've brought the BFG in at the end! And thank you for your kind words about my books. Varjak Paw took me 5 years to write, but all the hard work feels worthwhile when I get fantastic comments like this from readers like you. Thanks so much again, Alex – I'm really glad you like the drawings. Dave McKean is a brilliant artist! Have you seen his artwork and trailer for my new book Phoenix yet? Phew. This might be a long one. So, when I was little, my parents read to me a huge amount - which lead to me wanting to read myself. I also had a massive fascination with cats (I still kinda do) which meant I read pretty much anything with a cat on the cover. However, when I get the chance, I love to read to my little sister. The first books I read to her was your incredible Varjak Paw duology. I should point out that she's not much of a fiction reader herself, and yet she loved both books and was sad (as I was) to see them come to an end. It was incredible to read the stories again, and understand them on a deeper level now that I'm older. I got actual chills reading through the endings of books 1 and 2 for what might possibly be the hundredth time. Now, for english, as a sort of prep-task for our speech coursework, we were asked for hw to prepare a speech on our favourite children's book. And of course, it had to be Varjak Paw. When researching it, I came across your site. I was elated to discover that not only have you authored other books (which I will definitely check out when I can) but that you will possibly at some point in the future write a third Varjak Paw book (Can't wait to tell my sister about that one)! Keep the way alive, Varjak Paw. PS. Man, I love Mckean's illustrations. Do you know where I could find more of his work, or what other books he's illustrated or films he's directed? Thank you so much for your incredible message! It means a huge amount to me to hear about the part that my books have played in your life, and your sister's. I don't find writing easy - Varjak Paw took me 5 years to write - but all the hard work feels worthwhile when I get a reaction like that from a reader. I hope you enjoy Phoenix too - if you're in North America, it will be published there by Candlewick Press in October 2016. Here's a link to Candlewick's page about it. Dave McKean is incredibly prolific - he's illustrated a huge number of books by authors including David Almond, Neil Gaiman and Ray Bradbury, has made many books of his own, and has directed 3 feature films and many shorts. He's also a great musician, and did all the music for the Phoenix book trailer, which you can see here. And here's a link to his website, where you can find more information about him and his work. Good luck with your own writing - and keep the Way alive! Thank you so much! I hope you enjoy The Outlaw Varjak Paw as well. The Way was something that developed as I worked on the story – it wasn't there in the first draft I wrote! But I found the idea of secret martial art for cats very interesting – I hope you liked it too. I loved VARJAK PAW and I am now reading the Outlaw VARJAK PAW, I am not very far into it, but I have read the bit when VARJAK takes on a fight with Razor and nearly killed him!!! I did not expect that! I love Cludge and the way he struggles to speak and cares about his friends. I love VARJAK PAW and I love THE OUTLAW VARJAK PAW. How do you come up with such amazing ideas??? I would of never thought of the Ways and the creative names and where its set out if I wrote a story, so how do you do it??? Thank you so much for your fantastic comment! That really means a lot to me. I wrote a little bit about how I get ideas, and about my writing process in general, in a blog post which you can read by clicking this link. And you can also find all the writing tips I've ever done on my blog by clicking this link. I hope they're helpful! Dear SF, my name is Ned and we were told today that you will be visiting my school, Great Wilbraham Primary. Thank you so much for your comment! I'm looking forward to visiting your school and meeting you all – and I love signing books! Which one of mine is your favourite? Dear SF, thank you for replying to me. My favourite book is 'The Outlaw Varjak Paw'. I really loved the ending when I found out Holly was still alive. I've just started reading 'The Phoenix' with my mum and dad. The tension in the story is really good and keeps me wanting to read more. Thank you so much! It was lovely to visit your school, I really enjoyed meeting everyone. I hope you enjoy reading the rest of Phoenix! One of our young readers has posted a wonderful review of "Phoenix" at our new website (www.kidseyebooks.com). If you happened to leave a comment for him there, we know he would be thrilled! Thank you so much for letting me know! It is a wonderful review of Phoenix, and I've left him a comment. And thank you for giving space to children's reviews of children's books - I think you're doing a terrific job! Hi I am Valisha Martin my teacher Mr.Rahim He read Varjack Paw and The outlaw varjack paw. I love the book so much you are so talented in writing your stories and so deatailed Can you turn them into a Movie. Thank you so much for that amazing comment - it really means a lot to me. I don't find writing easy, and it takes me years and years to write each book, but all the hard work feels worthwhile when I hear from a reader like you! Tyger is not about space; it's a whole new project. I can't say too much about it, because my books always change a lot as I write them! But here's a blog post I made about it - I hope it won't be too much longer now before the first book is published! I have written a book and wanted to know if you had any recommendation on an agent to submit it to. If you can be any help, I'd appreciate it greatly. Thank you so much for your comment! Which is your favourite one so far? I teach Year 4 and we are currently reading Phoenix- my class absolutely love it! We are 5 weeks into analysing your writing techniques and my class are hocked (and we’ve only read up to Chapter 7)! They would be overwelmed to read a reply from you, as they are currently writing their own ‘Phoenix Style’ story this week. Thank you so much for your message! I'm really glad you're enjoying Phoenix - that book took me 7 years to write, but all the hard work feels worthwhile when I hear from readers like you. Thank you so much for your reply- my class are going to be so excited! Wow, 7 years is a long time, however this will show my children that perseverance pays off! Thank you for sending the link, I will definitely read it and share with Year 4. Thank you - it's always a pleasure to hear from teachers who are working with my books! Please do let me know how it goes - and feel free to tweet me any writing, artwork, questions etc that come out of reading Phoenix with Year 4. You can find me on Twitter as @whatSFSaid here. Year 4 have completed their stories and they are amazing! We are unable to send you any work examples, however I wanted to inform you that the children have really adopted your style of writing and have packed their stories full of brilliant description- just like Phoenix! They have also analysed your use of short and extended sentences and used them in their writing too, to engage and draw-in the reader. Year 4 also found your writing tips blog really inspiring and useful. We just wanted to say a really big thank you for your replies and support. That's so wonderful to hear! Thank you for working with Phoenix - and please wish Year 4 happy writing & happy reading from me! You wouldn’t believe what had happened when we came back from the holidays in September (Marisa)! Our classroom had been ransacked and looked like a dump (Idman and Rachele)! There were scratch marks on the working wall, 'Missing cat@ posters, empty cat food and cat cages, a toy mouse, cat fur, footprints and a copy of your book - but no cats! It looked as if a cat had vanished so we investigated further and wrote newspaper reports about the Vanishings and designed a front page. We got ideas from your book to use in our writing (Divine), for example we wrote a diary entry in role as Varjak (Emily) and also created an extra chapter where Varjak met another character. While reading we did readers’ theatre where people take the role of different characters and speak their words (Ludwig), freeze frame, to get to know the characters, and conscience alley, to help Varjak decide whether to stay or go (David). We played a game found in Mesopotamia called the Royal Game of Ur – the oldest board game in the world (Pia) – and wrote instructions on how to play it (Caitlin). In guided reading we read the first chapter of The Outlaw Varjak Paw and an interview with you. We used the Seven Ways of Jalal to create our own ways of learning and behaving – they are the Seven Ways of Year 4 (Aoi): Floating Hands, Bubble Focus, Shadow Walking, Connecting Minds, Sharing Opinions, Writing Awareness and Listening Time. Our favourite characters were Varjak (4 votes), Sally Bones (3 votes) but the clear winner was Cludge (23 votes) (Cassius). You might remember coming to our school before (in January 2016 when we were in Year 1) and we’d love it if you could come again. Best wishes and merry Christmas from Year 4, Dundonald primary school. Thank you so much for your wonderful letter! It was brilliant to hear that you enjoyed reading Varjak Paw. I loved hearing about all the things you've been doing with it. I particularly love the fact that you discovered the Royal Game of Ur from Mesopotamia, as I've played that game myself! Like Varjak, I have some Mesopotamian ancestors, so I'm very interested in Mesopotamian history, civilisation and mythology - the oldest stories in the world are ancient Mesopotamian myths. I'm delighted that reading Varjak Paw has led you to discover some of this for yourselves, and I hope you enjoy The Outlaw Varjak Paw too! And I do remember visiting Dundonald! If you'd like me to visit again, please ask your teacher to leave me a message on my author visits page, with an email address for me to reply to, so we can discuss the possibility.